11.2.0.3’ten 11.2.0.4’e upgrade ederken aşağıdaki hatayı verdi çünkü 11.2.0.3 db’de timezone versiyonu 28 idi (yaz saati patch geçişi sonrası) 11.2.0.4 yeni Oracle home’unda ise timezone versiyonu default kurulumda 14 olduğundan dolayı. E.3) Can I “downgrade” to a lower DST version? No, that not possible, please do NOT rollback dst patches who are used by the database(s) of the home in question. RDBMS DST patches can be rolledback using Opatch but you cannot “downgrade” the DST version using DBMS_DST. If you have for example an DSTv23 database ( DST_PRIMARY_TT_VERSION = 23) and you rollback the DSTv23 patch using Opatch then the database will open but will NOT function properly. Seen all DST version are cumulative there is also no real reason to “downgrade” a database DST version. 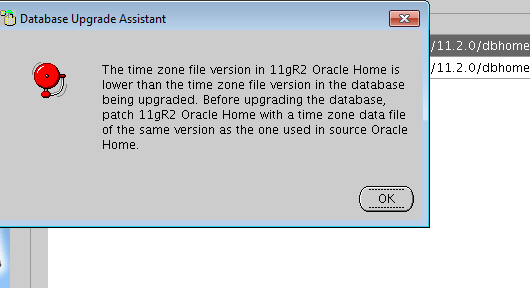 11.2.0.4 Oracle Home’una da yaz saati değişikliğinde geçtiğim 24701840 patch’ini uyguladıktan sonra her iki Oracle Home’un timezone versiyonu 28 olarak eşitlenmiş oldu ve dbau – Upgrade’de aldığım hatayı geçmiş oldum. ApplySession: Optional component(s) [ oracle.oracore.rsf.core, 11.2.0.4.0 ] not present in the Oracle Home or a higher version is found. Instantiating the file "/oracle/app/oracle/product/11.2.0/dbhome_2/.patch_storage/NApply/2017-02-16_09-30-33AM/rac/copy_files.txt.instantiated" by replacing $ORACLE_HOME in "/oracle/app/oracle/product/11.2.0/dbhome_2/.patch_storage/NApply/2017-02-16_09-30-33AM/rac/copy_files.txt" with actual path. Instantiating the file "/oracle/app/oracle/product/11.2.0/dbhome_2/.patch_storage/NApply/2017-02-16_09-30-33AM/rac/copy_dirs.txt.instantiated" by replacing $ORACLE_HOME in "/oracle/app/oracle/product/11.2.0/dbhome_2/.patch_storage/NApply/2017-02-16_09-30-33AM/rac/copy_dirs.txt" with actual path.